While unable to usurp the title of Taber’s sweetest export — here the mighty sugar beet still reigns supreme — delicious corn has been hitting the stands throughout southern Alberta in August, and Bow River MP Martin Shields has sank his teeth into more than few cobs that have roamed far afield. “It’s delightful to see Taber corn around my constituency. Wherever I’ve been, people have been delighted to be able to buy Taber corn,” said Shields. 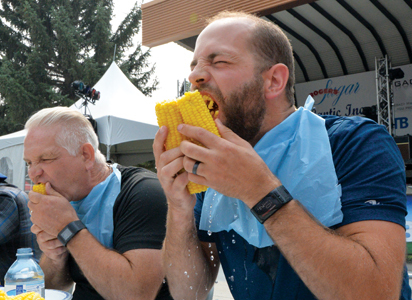 A trademark product known from coast to coast and pretty much everywhere in between, acquiring a few cobs of the tasty vegetable has become a late-summer rite of passage for many Albertans. “It’s out — it’s a little earlier than some years — and so there’s all sorts of people saying, ‘have you got your Taber corn? Great to see Taber corn.’ And I hear that from one end of the riding to the other this past couple of weeks,” said Shields. Shields praised the efforts of many dedicated producers and marketers over the years who have contributed to making the product a hallmark of agricultural production known nation wide.